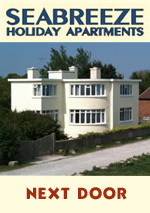 We continue to take bookings for Seabreeze Holiday Apartments, next door. The apartments sleep a maximum of four to five guests. We are not able to accommodate dogs, as Seabreeze is a multi-occupancy site. If you are interested in finding out more, please click on the panel on the right. The owner of Amberley Cottage has decided not to take further bookings after March 2019. We would like to thank all of those who have stayed in the cottage in recent years, since we have been taking the bookings.